Julie M: Watched Atithi Tum Kab Jaoge [Revered Guest, When Will You Leave? ]…somewhat funny, mainly due to Paresh Rawal. 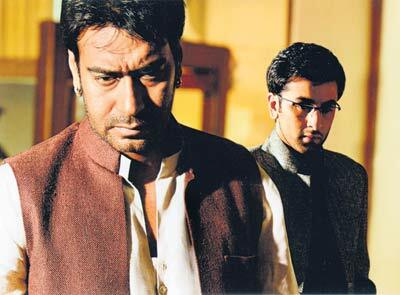 Ajay Devgan and Konkona Sen Sharma were serviceable, but as primarily dramatic actors I felt they were wasted in the comic aspect of their roles. A few genuine laugh-out-loud moments. Why why why do they have to insert those stupid boing-boing noises?? Would have been funny enough without them. And from the beginning I knew what the very end would be. Overall–I don’t generally watch this kind of farce-comedy in English (OK, I admit to watching and enjoying Hot Tub Time Machine but deeply regretted saying OK to The Hangover and Are We There Yet) and probably won’t watch more in Hindi either. Here’s the trailer with English subs. No subtitles but you get the idea from the action that they are frustrated with this guest and want him to leave. Julie M: Saw Sholay [Embers] last night. Two things I wish I’d known going in: that it was 3-1/2 hours long, and that it was a WESTERN. I Hate Westerns. From the first plot intimations I kept flashing back to The Magnificent Seven, except the village-protectors were somewhat-comedic crooks instead of professional gunmen (now picturing in my head The Three Amigos, who, despite being actors rather than crooks, were comedic), and there were songs and dances. It seemed only vaguely Indian…in my mind I kept calling it a “curry western”…everything was there: riding around on horseback, the dusty landscape complete with cactus, the rich rancher, the thirst for revenge, gun battles, the innocent townspeople, gun skirmishes before the Final Stand, etc. Even a train robbery. So this is an Indian classic? Hmph. And if you want to see the scene they refer to in ATKJ, here it is. I couldn’t find it with English subtitles, but essentially the villain (Gabbar Singh, the one with the beard) is berating his crew for letting two (how many? TWO! how many? TWO!!) strangers get the better of them, and exacts punishment. The guy on the right is the older actor that Chachaji pesters on the film set in ATKJ. Anyway, I’m glad I watched it but will be sure to warn people that if they don’t like Westerns they will likely not enjoy this film. I can’t say that I entirely enjoyed it although there were moments that I recognized as “classic”. Jenny K: Sorry about that, I thought I had mentioned that Sholay was a Western, but maybe not. My mom had just the same reaction to the Hitlerized Jailer, too. “Speed up past that bit, let’s get back to Amitabh!” She didn’t like the “silly stuff”. And on the whole, I agree. and Sardar, a bio-pic he did a few years earlier, about Vallabhbhai “Sardar” Patel, a compatriot of Ghandi and Nehru who fought to keep all religions safe during partition. The movie’s on YouTube (in 16 parts, with subtitles) I haven’t watched it yet. Julie M: One of the movies I reserved from the library for this weekend is The Legend of Bhagat Singh. Can’t wait! Jenny K: As I remember it, Ajay did a good job, of course, but he seemed a tad old for the role. 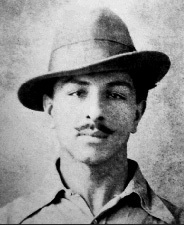 Bhagat Singh was 24 when he died. But that doesn’t seem to stop anyone in film these days, if they want a role. There was at least one other version of the story being filmed at the same time. 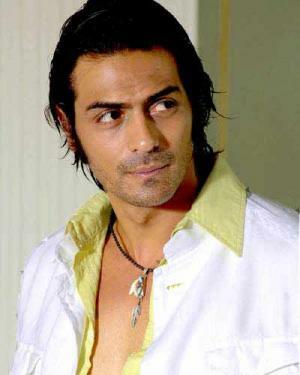 This one with Bobby Deol in the lead…yet another over-thirty trying it on for size. I think Ajay’s beat Bobby’s to the cinemas, and I believe did better at the box office. I think it was a bit slow for my taste, but Ajay was very heroic. The multiple Bhagat Singh films explains a joke in KHNH, I think, where Preity’s suitor came to the house with lots of kids in turbans, and when they are introduced to the family all are named Bhagat Singh, of course a very popular Sikh name, but not usually in multiples. When the family looks confused the father says something like “You can never have too many Bhagat Singhs!” This was just the time the other films were in the pipeline and making lots of press. Though I will say, not having seen the Bobby Deol version…he looks a bit more like the pictures of Bhagat Singh that have come down to us in the papers of the day. Both too old though. Julie M: Well, Saawariya [My Beloved] was a bust. The library DVD was all scratched up and it won’t work for more than 20 minutes at a time on any of my players or computers. I got a bit more than halfway through, watching in bits and pieces, and gave up. But from what I saw it is stunningly beautiful visually, and I loved how it was done kind of like a staged play. Not the least of the stunning visuals was Ranbir…this number just about made me faint, and I’m sure I wasn’t the only one. But then his hair inexplicably turned Beatle-esque (Ringo, I believe) and the bloom came off the rose a little. Still, he’s adorable and I could definitely stand to see more of him (but not THAT way—more of his acting! Acting!!). Overall, too gushy of a story for me to exert the effort to finish the DVD (you know me, I am not the gushy romantic type) and I cheated online to see how it ended. Meh, for the storyline. If it were not directed by Sanjay Leela Bhansali it would have been ordinary and boring. Jenny K: I may have a copy of it if you wanted to see the ending. Not sure, I think I picked it up in a discount bin somewhere. Blockbuster, not the pirated ones. That scene with Ranbir and the towel was a BIG scandal when it came out, but I remember thinking at the time when I saw it on the big screen that it wasn’t worth all the furor. They spoke in the reviews as if he were completely naked, but unless you were his neighbors across the street, you didn’t see it all…and it wasn’t necessary. I think that when he fell off the chair and was seated on the floor that I saw a pair of shorts on him past the edge of the towel in one shot. Still and all, he is a cutie. Yes, you definitely should pick up a copy of Bachna Ae Haseeno. I think it’s his best so far. Julie M: I’ll try to find BAH. It’s not at the library, so I guess I’ll have to get it another way. Sigh. On another, and seriously disappointing note, it seems as if the my local theater here has stopped showing Indian movies, just since I saw ZMND there a couple of weeks ago. That means my closest first-run theater is now in Chicago. Grrr. Jenny K: Don’t give up hope. A lot of the theaters that carry Hindi films can’t afford to show them without the big crowds, so they only book them for a week, or at the most, two weeks so the locals learn to come early or miss out. Then the theaters go back to programming American films in between. It’s especially true at multiplexes, where only one or at most two theaters are dedicated to the South Asian community’s films. Check again in late October. Don 2 is coming out for Diwali… your theater will book SRK. And I’ve heard a rumor that Hrithik is doing a cameo in it.